A wonderful group of five original vintage florists vases. 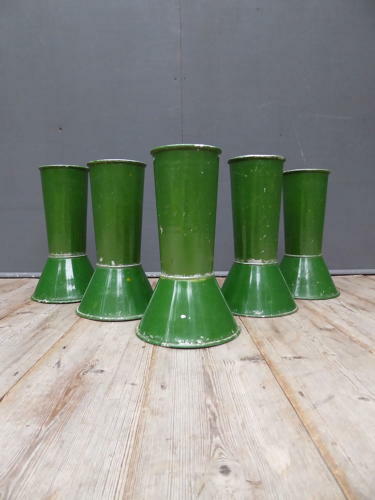 Five two-piece aluminium vases in their original painted finish in a fantastic shade of green with just the right amount of wear. Likely used by a street flower seller & display so well as a group. Price is for the five. Wear commensurate with age, totally unrestored showing numerous pleasing signs of their past. Measurements above refer to a single assembled vase.